World-famous landmarks in the Waikiki area include Diamond Head, the Moana Surfrider Hotel, Waikiki Pier and the Yacht Harbor. Top attractions are the International Marketplace, Pearl Harbor, the Waikiki Aquarium and the Polynesian Center. Waikiki is home to many beautiful beaches. Find the beach that best suits your needs and dreams. There are plenty to select from! Popular activities include surfing, golfing, deep sea fishing, ocean kayaking, running, snorkeling and body boarding. Many wonderful hotels are available between the beach and Ala Wai Canal. In general, prices drop as you move away from the ocean. Most visitors arrive at the Honolulu Airport. 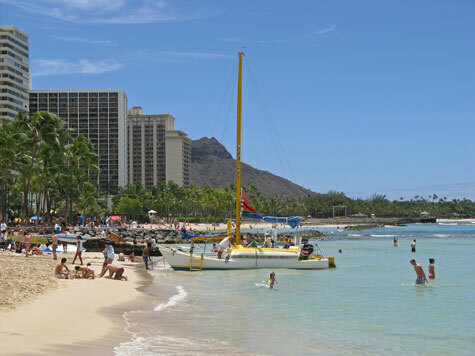 Bus, coach and taxi service is available to Waikiki Beach. Trolley Busses are great for sightseeing.